Oto Gillen, 3 WTC, June 6, 2016, 2018. Dye sublimation print on aluminium, wood. 33.5 x 49.5 x 1.75 in. Courtesy of the artist. Metro Pictures presents Evidence, a group exhibition organized by Josh Kline. Featuring the work of seven artists, Evidence investigates the nature of documentation and reality in post-truth America and their potential for political manipulation. The artists in the exhibition respond in different ways to issues of class and inequality in the United States. Sampling images, materials, strategies, or subjects from the real world, each grapples with the ethics and implications of altering that reality, injecting it with carefully metered dosages of fiction. The artists all address different aspects of our current political environment in which the distinctions between fact and fantasy have been deliberately confused. The works in the exhibition span a diverse range of subjects and media. Paul Chan’s sculpture Dimposium, from his “breather” series, imitates inflatable air dancers, adapting their technology to make a three-dimensional animation. Allyson Vieira uses construction debris netting to compose an installation framing sculptures made from post-consumer waste—melted-down styrofoam with collaged plastic shopping bags—referencing class and labor conditions. Josh Kline’s sculptural portraits, a continuation of his Blue Collars series, are made from 3D-printed photographic scans of service staff at two national chain restaurants. They are accompanied by a video interview with each staff member discussing their day-to-day lives in the service industry and the 2016 U.S. presidential election. The charged nature of political discourse is also explored in Liz Magic Lazer’s video Primal Speech, which references Primal Scream therapy techniques and applies them to a staged therapy group comprised of characters holding opposing political views on Brexit and the 2016 U.S. presidential election. Paul Pfeiffer’s new videos visualize an altered reality by digitally removing the host, prizes, and other narrative trappings from footage of the long-running TV game show The Price is Right. The videos show a succession of contestants left alone on stage surrounded by anticipation, emptiness, and silence. Gloria Maximo’s immersive video installation La Toilettelikewise addresses material concerns, asking viewers to consider basic human needs like shelter, food, and rest and the challenges which render those needs inaccessible to certain individuals within our society. 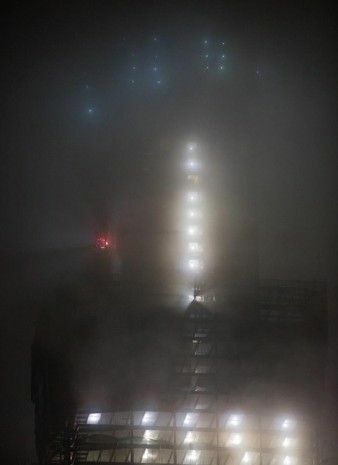 Capturing one of the most iconic symbols of our current polarized economic environment, Oto Gillen’s photographs of One World Trade Center render the building ghostly and alien, a heraldic presence emblematic of an unfamiliar, divisive new age.